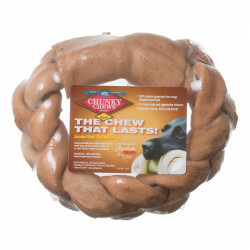 Chunky Chews dog treats by Pet Ag are the chew that lasts! Exclusively designed for big dogs and powerful, aggressive chewers, Chunky Chews rawhide products are packed extremely dense, creating a solid, ridiculously tough bone, roll, twist or ring of solid rawhide that's more than three times the weight of the industry standard. Chunky Chews are made of natural, grass-fed Brazilian beef and feature patented designs to prolong the chewing process for greater canine satisfaction. Apart from the toughest, longest-lasting natural rawhide chews on the market, Chunky Chews also offers specialized chews to meet your dog's specific needs. Glucosamine chews provides seniors and dogs suffering from arthritis or general joint problems with healthy relief while they enjoy a rich, satisfying, uber-tough chew. Additionally, the patented Safety-Knot bone design eliminates rough and pointy edges for a safe, fully enjoyable chewing experience.